Club Penguin Cheats by Mimo777 Club Penguin Cheats by Mimo777: Monsters University Team: Jaws Theta Chi Sneak Peek! Monsters University Team: Jaws Theta Chi Sneak Peek! The party's getting close! Hope you've all got your scare strategies ready! I'm joining the JOX! Who's with me?! Here is a sneak peek of our team's house. Let me know what you think! 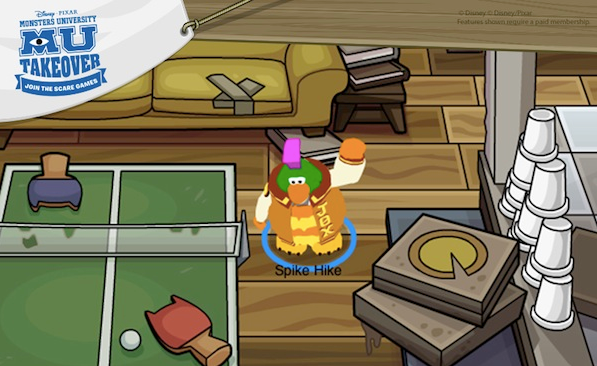 So, are you going to be joining Spike Hike? how does jaws theta chi become jox? Of course Spike Hike would pick the JOX team! June 30th Monster's University Scare Games Items! June 29th Monster's University Takeover Items! June 28th Monster's University Takeover Items! Penguin of the Day: Happysalad2! Monsters University Takeover is HERE! Penguin of the Day: Applebees561! Penguin of the Day: Pengver1037! Penguin of the Day: Ashrocks789! Monsters University Takeover Sneak Peek! Penguin of the Day: Honeypup34! Club Penguin's Star Wars Takeover! Club Penguin Star Wars Party? Club Penguin Message From Rookie! Club Penguin of the Day: Coolpool79! Club Penguin Puffle Digging & Stamps! Club Penguin Puffle Handbook Update! Club Penguin Sneak Peek Video: Puffle Digging! Penguin of the Day: Talia2020! Club Penguin Stamps Reviewed By You! Penguin of the Day: Ninjaoninja2! Scare Games Update by Polo Field! Penguin of the Day: Midnight Emo! New Club Penguin Stamps Coming Soon! Penguin of the Day: DrPenguin193! Club Penguin Pin Cheat - NEON FLAMINGO PIN! Furniture Catalog Cheats: June 2013! Penguin of the Day: Julian18861! Penguin of the Day: Chilly0ne! Monsters University: Scare Games Team Rivals! Penguin of the Day: Bellabea! FREE Club Penguin Coins Codes! VIDEO: Monsters University Takeover Trailer! Penguin of the Day: Danpenguicp! My Penguin App Party TODAY! Penguin of the Day: Skyla61577! Penguin Style Catalog: June 2013! Club Penguin's "Summer of Awesome!" Card-Jitsu Snow Strategy Reviewed By You! Penguin of the Day: Timmy738! Penguin of the Day: Raypenguin18!